Was taking care of biz last Thursday afternoon and decided to check my email. The subject line – “Congratulations from Psych Central on your blog.” And if that wasn’t enough to set my heart a racin’, it was from Psych Central’s founder and producer John Grohol, PsyD. 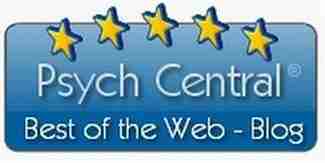 I’m writing to inform you that you’ve won the Best of the Web – Blog award from Psych Central, the oldest and largest mental health resource online that’s been reviewing online resources since 1992. We receive over 6 million unique visitors per month from all over the world. The top ten list in depression was compiled with input from our readers, one of my associate editors, and myself. It reflects the excellence in regular writing of entries related to this mental health concern that we feel is consistent and worthy of people’s time. Needless to say, it took some time for it all to sink-in. ‘Course, it finally did and I was left with feelings of warmth, appreciation, and satisfaction. Chipur readers, thank you for your faithful visits, comments, and support. Without the inspiration, motivation, and gratification you provide, Chipur doesn’t happen. P.S. Be sure to check-in with Psych Central. John and staff do incredibly fine work.